The problem with ‘luxury’ watches is that almost any manufacturer can slap a band and a case together, add a few design elements, and push it as a ‘luxury’ timepiece. It can really be too much. It is too easy to become jaded in the world of men’s timepieces and roll your eyes when you see another ad for yet another luxury timepiece. Sadly, the phrase ‘luxury’ has been thrown around so much that it is at risk of being easy to dismiss as yet another ‘weasel’ word used by slinky and greasy salespeople trying to make a commission off you. Thankfully, there are timepieces that truly seek to restore our faith in the meaning and gravity of the phrase ‘luxury.’ Yes, luxury is an attitude and it isn’t defined merely by price or materials. Yes, luxury is all about precision and rarified passion. Thankfully, Armand Nicolet knows the score and delivers a timepiece that can restore anyone’s faith in the power of a true luxury men’s timepiece. With only 140 pieces in existence, the Armand Nicolet Men’s 8649A-GL-P964GR2 L07 Limited Edition Watch definitely pulls through when it comes to ‘limited edition.’ I know you’ve heard that phrase many times before and probably yawned at the fact that many ‘limited edition’ watches aren’t limited at all. After all, what’s so ‘limited’ about a 5,000 unit production run? Well, the 8649A-GL-P964GR2 L07 Limited Edition will restore your faith in luxury watch manufacturers. When Arman Nicolet says ‘limited edition,’ it means it. While this timepiece does come with a very steep price (over $25,000), scoring this great timepiece will definitely put you in very rare company. Let’s put it this way-many other design brands talk a big game about ‘exclusivity.’ Well, this Armand Nicolet unit, both in its limited production run, its design, and its overall value, embodies the very meaning of that word. 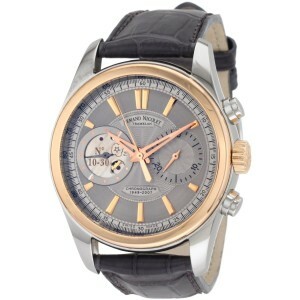 The 8649A-GL-P964GR2 L07 is actually Armand Nicolet’s initial foray into the chronograph space. Talk about starting out with a bang! Besides the price tag and very limited production run of this watch, this timepiece can never be accused of being shoddy, shabby, or half-baked. The design house behind this model went all the way. From a stainless steel and 18k gold case to rose gold bezel to hand wind manual movement, this watch puts a distinctively luxurious spin on the familiar chronometer design formula. In keeping with all true luxury watches, this timepiece needs you to wind to keep it going. You can’t go anymore old school luxury than this. While many other luxury design houses have given in to the temptation of automatic or even, gasp, quartz movements on ‘luxury’ models, Armand Nicolet holds the line with the 8649A-GL-P964GR2 L07 and keeps to a classic 1950s vintage movement system. What makes this watch distinctive (in addition to its price tag) is its very eclectic mix of chronograph design and 50s era movement type. Considering the many different design elements and overall attitude of the 8649A-GL-P964GR2 L07, it would be safe to say that Armand Nicolet succeeded in this unlikely pairing. If you want a truly distinctive watch and don’t want to blow a hundred thousand or so on very limited runs, you might want to the try the limited edition 8649A-GL-P964GR2 L07. Not only do you get to wear a rare timepiece, you also get to wear a great design pairing of manual time movement with a chronometer form. Definitely a serious choice for watch fans truly serious about luxury watches.